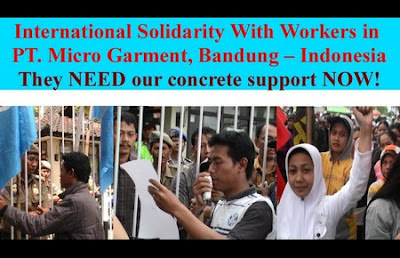 Laid off workers at the PT Micro Garment factory in Bandung, Indonesia are continuing to protest without success. “Until today (June 22, 2011) there has been no real action from the authorities both at regional or national level to protect the workers who have been laid off unilaterally by employer PT. Micro Garment, Bandung, Indonesia,” writes Ludovicus Mardiyono, from the International Network for Indonesia YCW. “Actions continues by 186 workers who have been laid off. Today (June 22, 2011) until June 24, 2011 workers will came abuzz to the office of the Minister of labor and Transmigration, in Jakarta. They will stay in the office of the Minister to urge the Minister to intervene and resolve these mass layoffs case. “To finance all this actions, the laid off worker has pawned their jewelry and motor bikes. In addition, this action is also supported by trade unions in Jakarta, Bekasi and Yogyakarta, which collects funds by busking on the market and city buses. “Demands of the workers is that they be reinstated in accordance with the rules of wage employment Act. Their plan to dwell in labor minister office for 3 days and held talks with Minister of Manpower and Transmigration, Mr Muhaimin Iskandar. “If possible (cost enough) they will come abuzz to the office of president and parliament which are not far from the Minister office. “Call for support is expected from all sides both politically and financially. We thanks to all those who submitted their shouts to the government in Indonesia and to employer of PT. Micro Garment, also to the donors who have been providing financial support for our action,” he said. Action will continue until the demand for reinstatement of the workers is met, Mardiyono concluded.